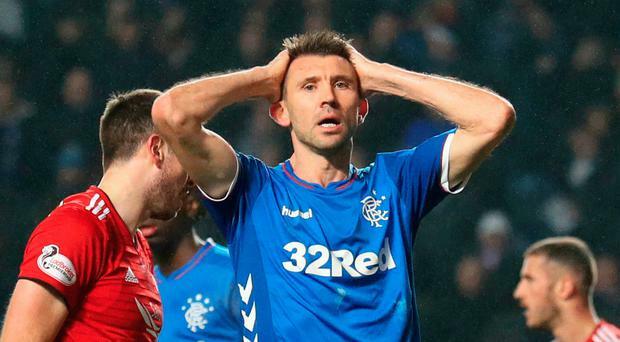 Rangers defender Gareth McAuley has told his team-mates they must learn lessons from their midweek defeat to Aberdeen at Ibrox in the Ladbrokes Premiership. A 1-0 home defeat ensured Rangers were knocked off the Premiership's top spot after spending less than four days at the summit. Steven Gerrard told his team they had to improve their discipline before the game - and then saw Alfredo Morelos receive his third red card of the season, although the first was later downgraded to yellow upon review. The night proved to be a damp squib for a jubilant home support buoyed by the end of their long wait for a place at the top of the league ahead of bitter rivals Celtic. Rangers found no way back from Scott McKenna's seventh-minute goal for Aberdeen, even after visiting striker Sam Cosgrove received the night's first red card. Now Rangers must wait until Sunday to face a Dundee side lifted by Kenny Miller's hat-trick in a 4-0 win over Hamilton. Asked about his side's character, McAuley said: "That is what this football club is about - it has been talked about. "You have to move on quickly, be as positive as you can and make sure you take everything on board, learn your lessons and hopefully it doesn't happen again." On his feelings after their first home defeat of the season, the Northern Ireland international said: "It is a disappointment, it's frustration and it's trying to find answers among ourselves. "It is one where we want to get back to work. "We let ourselves down and we let our standards slip all over the park really from where we have been, and we only have ourselves to blame. "We want to get back on the training pitch, get our work done and get our teeth into the game at the weekend. "The manager has come in and said what he's needed to say. I think we all knew we had let our standards slip, and that is personally as individuals where we need to look at ourselves and sort that out. "It is important we move forward and it's important we go and put on a performance on Sunday, and build again." Meanwhile, boss Steven Gerrard admits he is struggling to defend the behaviour of his Rangers squad after his warning about cutting out red cards was ignored by simmering striker Morelos, who has been something of a loose cannon this year. "I'm concerned. There's only so much I can do," he said after the game. "I've made it very clear they're not helping themselves, they're making their task a lot more difficult. "We miss key players for important games.